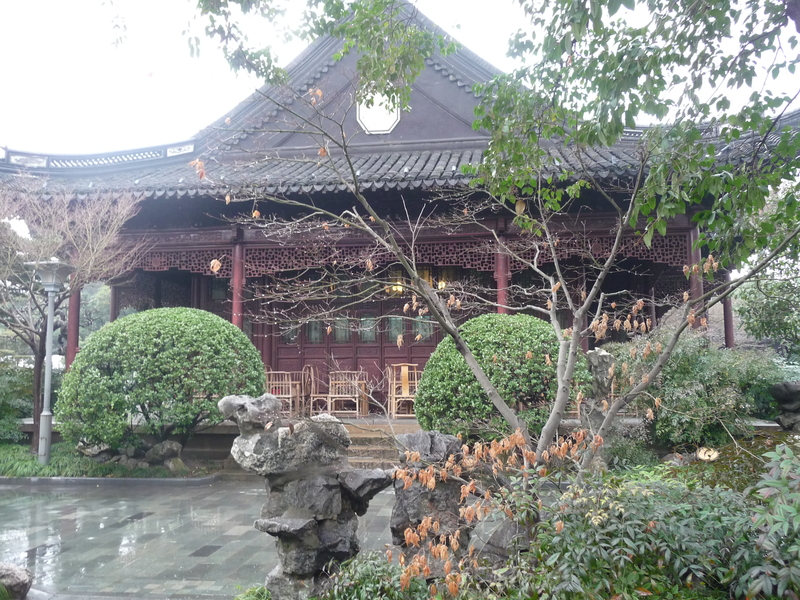 Vivi’s Visit: The Bund and Nanjing Road, Shanghai Museum and Parks | "Where in the world are Barry and Renee?" Here in Shanghai, we are good. The Chinese young woman who helped us last June in the Shanghai Train Station when we were on our way to Beijing, came a recent weekend for a visit. Although Vivi has been living and working (and struggling alone, she reports) about an hour-and-a-half from Shanghai for the last two years, this was the first time she has been anywhere in the city besides the train station. 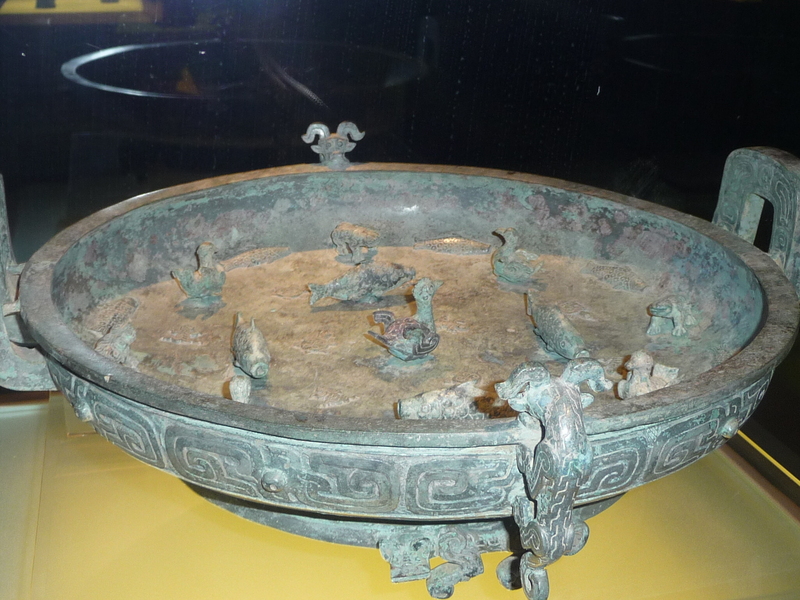 So we got to introduce her to the Shanghai Metro, People’s Park, the wonderful Shanghai Museum (where we saw among many other things, an 8,000 year old ceramic pot! 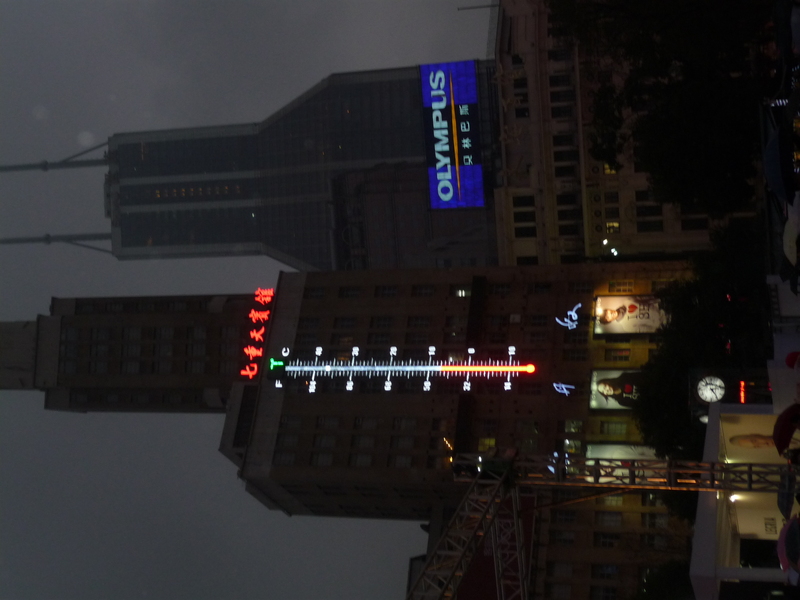 ), the high-end shops of Nanjing Road, and the always colorful Bund. 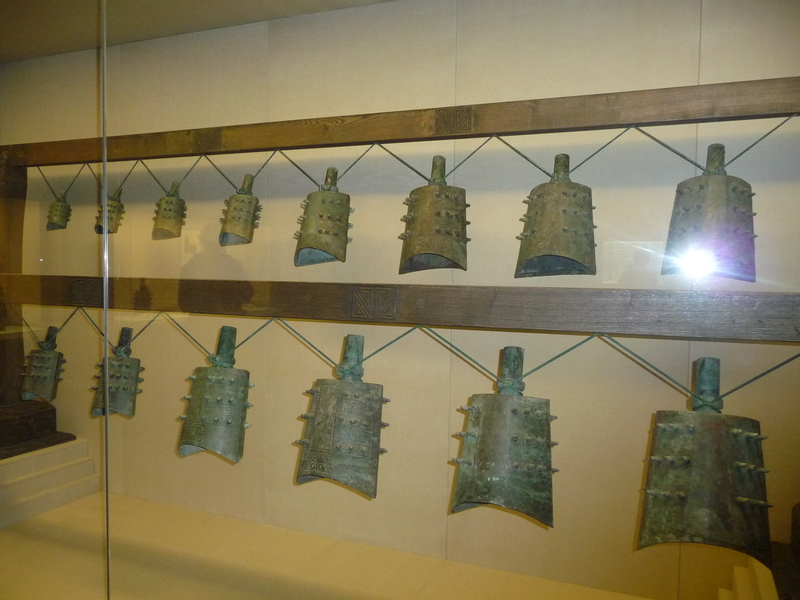 The four floors of the Shanghai Museum contain galleries for ancient Chinese bronzes, sculptures, paintings, calligraphy, ceramics, furniture, coins, minority nationalities’ art, and more. Going there is a wonderful way to spend an afternoon. 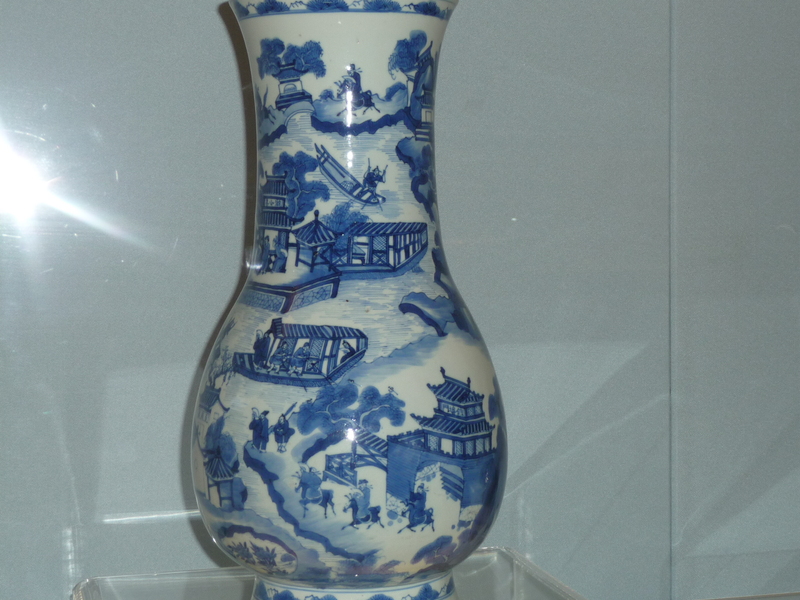 Go to <www.shanghaimuseum.net> for more information. After the museum closed at 5 pm, we wandered down the packed with people and shops Nanjing Road. 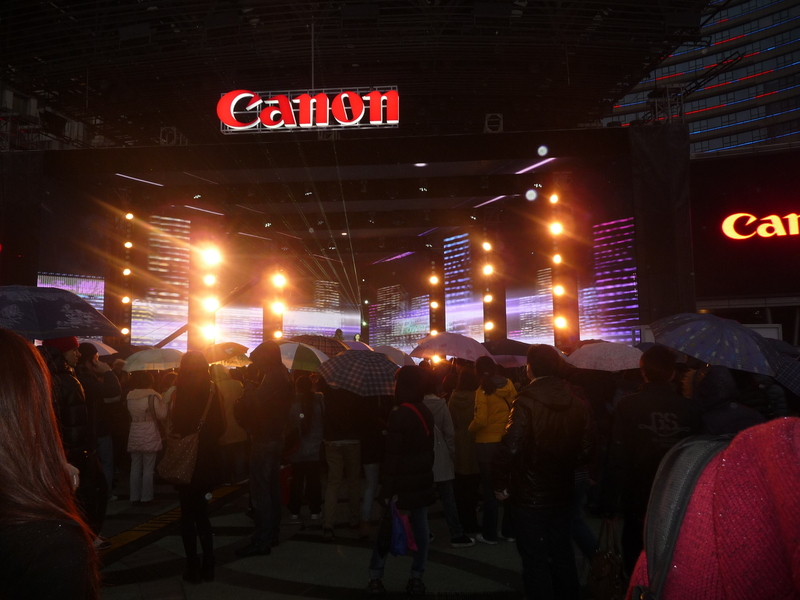 To advertise its PowerShot camera and other products, Canon sponsored a free concert that Saturday night on Nanjing Road. 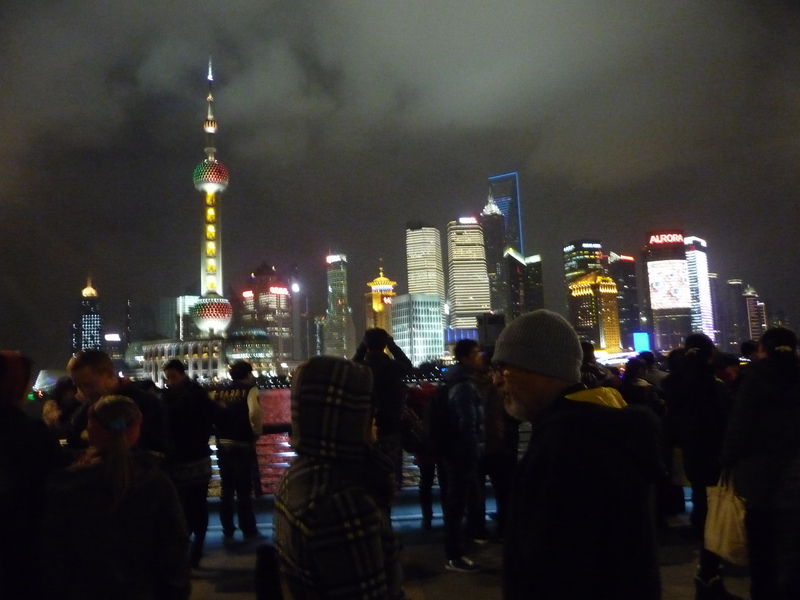 Then, of course, we walked on the Bund. We stopped for a great dinner and wandered more. Before we headed to the Metro, we stopped at a McDonald’s on Nanjing. I had a tea, but then it must have been really strong since I didn’t go to sleep until about 2 am. I did get to finish reading a book. 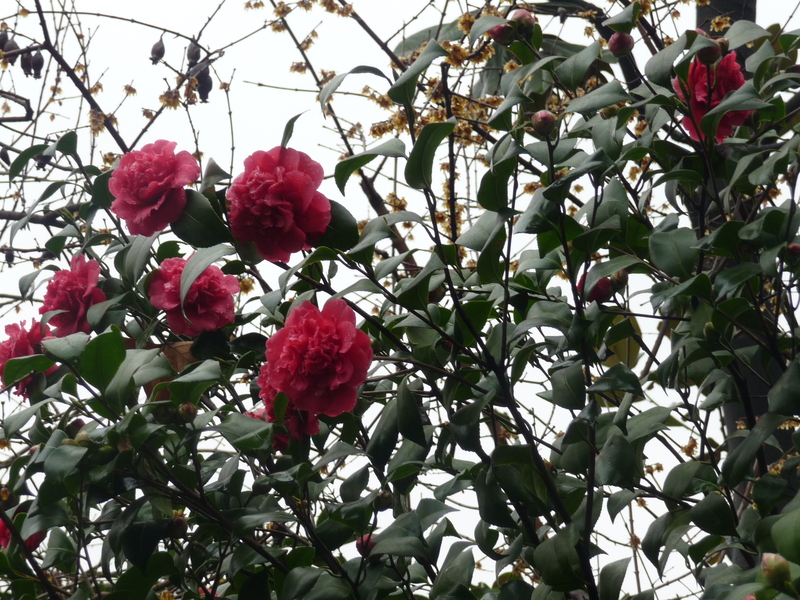 On Sunday, we took Vivi to two lovely Shanghai parks, Kangjian Garden, where the first flowers are starting to bloom, and to Guilin Park, near our SNU campus. 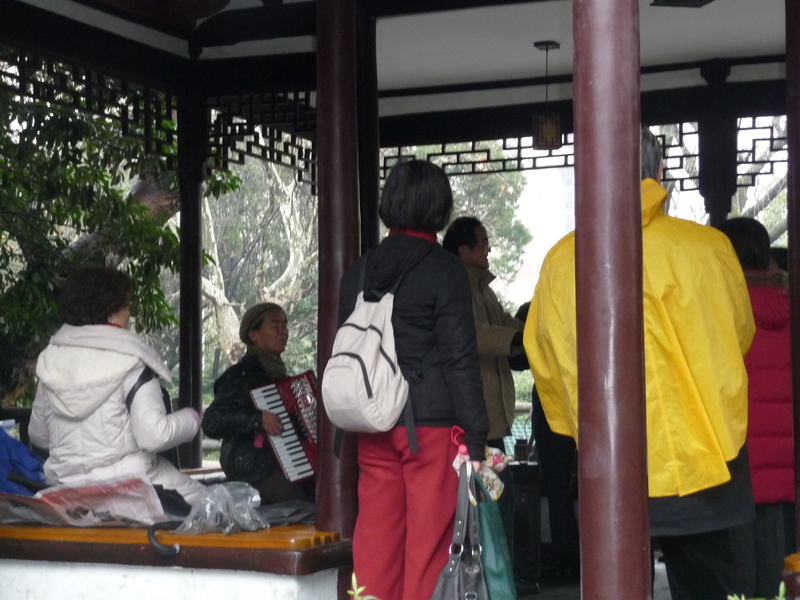 People gather in the park to play music and sing. 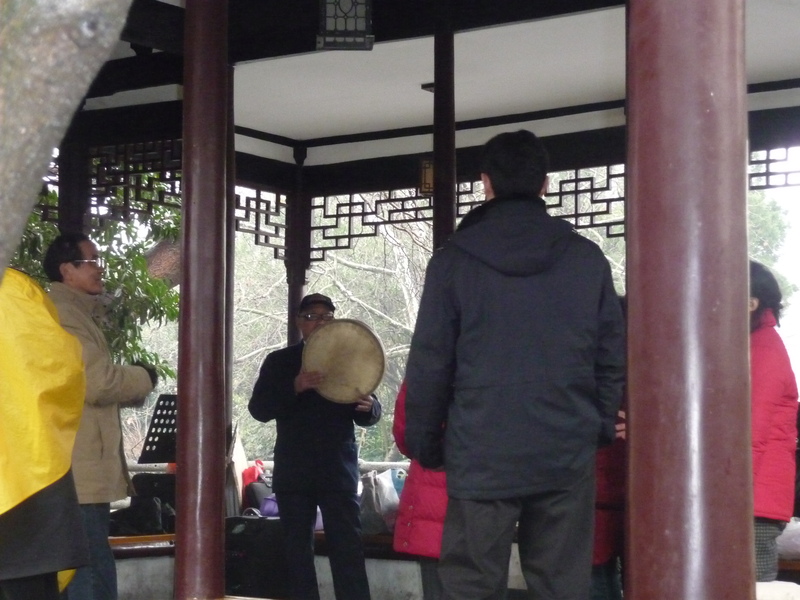 An accordion and drum accompanied the singers of a rousting song they were practicing. Vivi told us the song was about how glorious it was that the Chinese government was building a railroad, a song that must be from the 1960’s. They sounded professional! 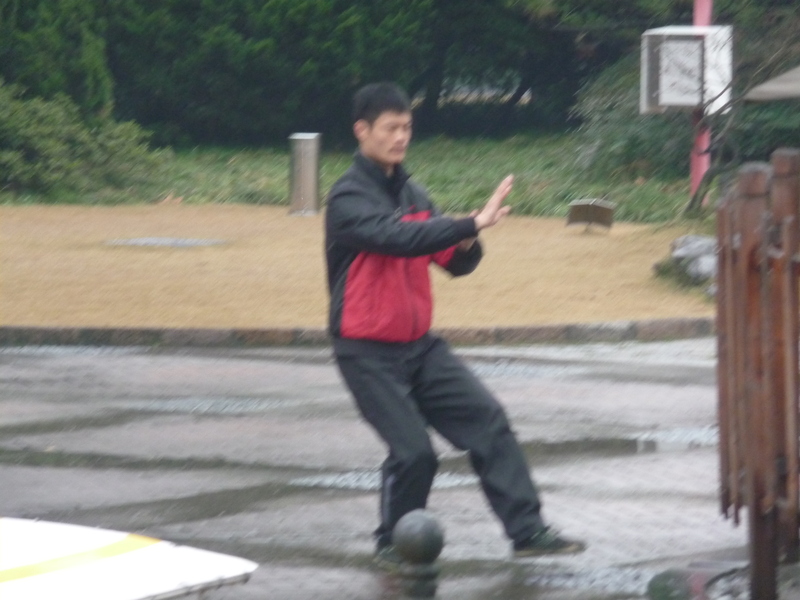 Other people danced, flew kites, or did tai chi. 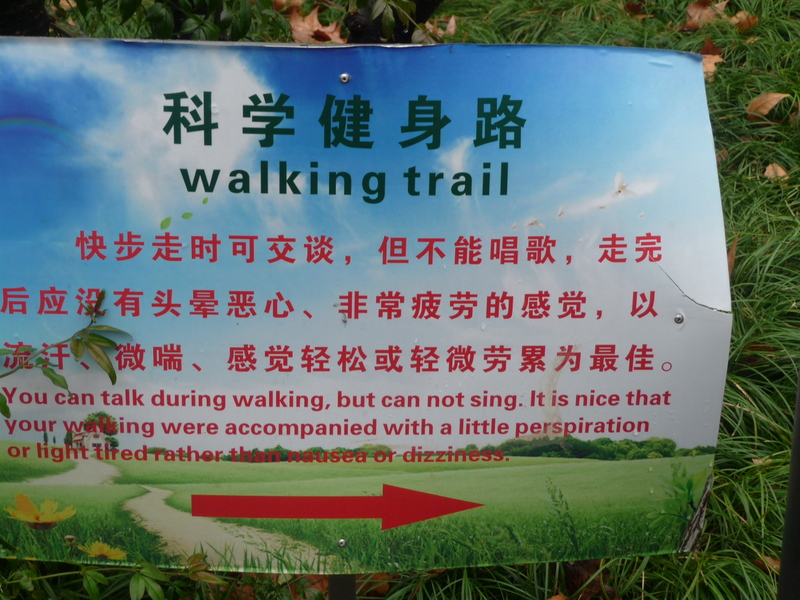 Signs encourage people to exercise, but we don’t really understand this one: “You can talk during walking, but can not sing. It is nice that your walking were accompanied with a little perspiration or light tired rather than nausea or dizziness. 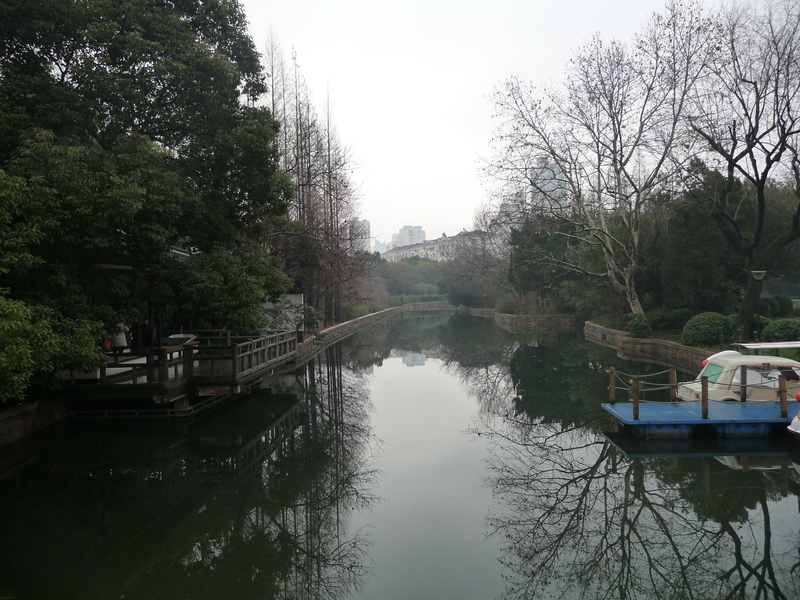 Then we went to Guilin Park near SNU. Now how many cats do you see? 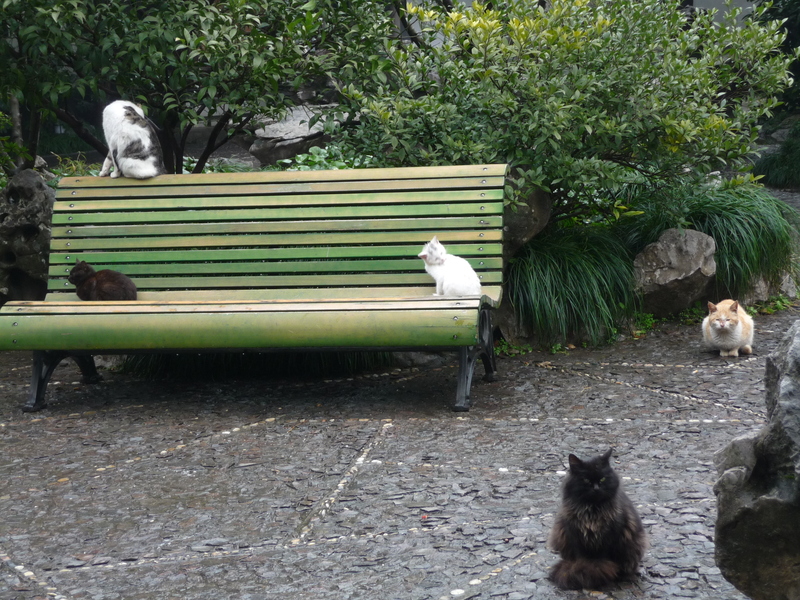 China too has a feral cat challenge. That afternoon, Vivi needed to catch the train back to her six-days-a-week job. She is 22, has a bachelor’s degree, two years of working experience, and her English is really good. Like the other Chinese students, she spent all her early years studying. She competed to get into college where she spent her freshman year in class 46 hours a week, and then she needed to study. She got an internship through a teacher’s recommendation, and has been working at PCV companies in marketing and sales (without a commission) for two years. 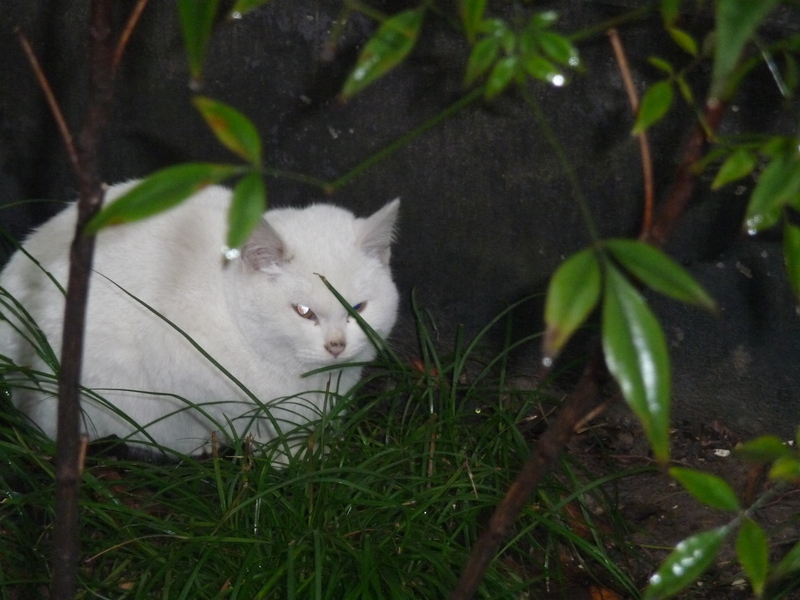 She is outside the city and lonely. In her field now, this situation is likely not to change. Long-distance trucks pass in front of her factory all day long. She now wants to change careers to become a teacher. She will need to study on her own to pass the teacher’s test since she is too old to get into a university. She wants to move back to her village, which is close to Xian (where the Terra Cotta soldiers are), to be near her family and friends. Even if she passes the teacher’s test, she will probably be placed in a rural school far from her home, but her brother-in-law works for the government, so she has a good chance to end up near home. Vivi is the youngest child of four (two are twins) . Her parents are farmers. They have been selling off their land to developers. They have one piece of property left. None of the children want to be farmers, but they will keep the one piece for the one son, so he will have property; however he is in the army. The farmers here, much like around the world, are giving up their land to developers and hope their children will do well in the new growing economy. Vivi says she knows that she must struggle. We wish Vivi much luck and a good future. 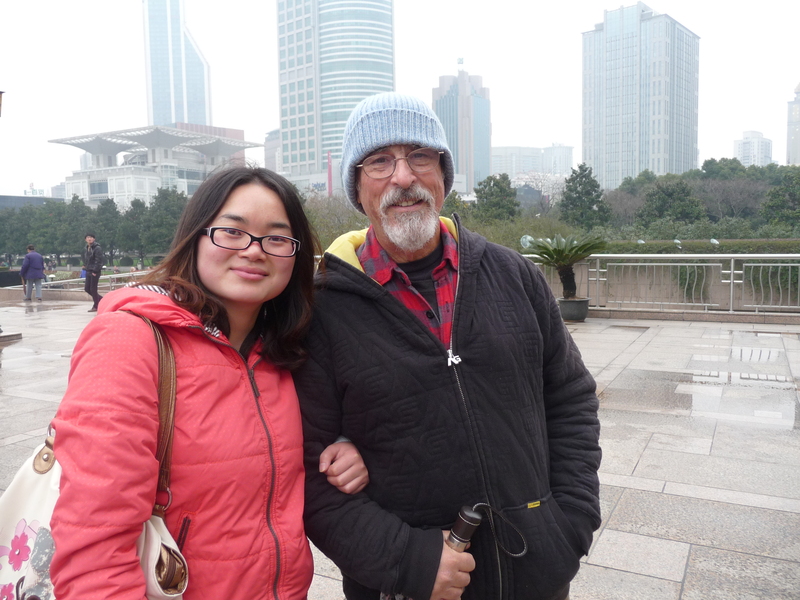 With our wandering and being tour guides, Barry is perfecting his walking tour itinerary of Shanghai. It’s been raining and in the 30’s and 40’s, but perfect for walking as long as you have boots and an umbrella, which we do. Come join us. Excellent post as usual Renee, we miss you guys and hope to see you soon.First beautiful sunny day today,walked home from class with no coat on! Enjoyed the blog with my coffee at Panera’s this morning…H off to the park to take care of his tree…the mulch needs to be pulled back from the trunk. Went to the new Supreme Buffet for dinner one night this week….It is really good food and the decor is upscale..
wOw know you would like it…but I did not check for snap peas…next time I will…. stoppedd at the cemetry in TH and wished grandpa a happy birthday. everything looked so much better there.